Have your dog's photo taken with the Easter Bunny! Pet parents are invited to bring the whole family to PetSmart’s free in-store event for photos with the Easter Bunny. This annual event will take place April 13-14 from 12 to 4 p.m. at PetSmart stores across North America. Pet parents will receive a free digital photo from PetSmart and can take photos with their own mobile device. Pet parents can also include their pets in Easter celebrations by stocking up on pet favorites. With items starting at $3, it’s easy to fill Easter baskets for all your pets this spring. PetSmart offers a full selection of springtime apparel, colorful spring toys and treats that are both delicious and beneficial for pets, such as dental treats, that will keep their tails wagging. For the first time, fan-favorite philanthropic toys Chance and Friends will also be available for purchase starting in April through July. Traditionally offered only during the holiday season, these collectible plush toys will be sold for $5, with 10 percent of the sales going to help pets in need by supporting the work of PetSmart Charities. 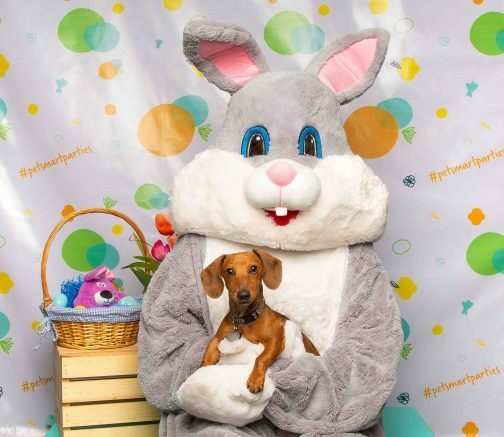 Be the first to comment on "PetSmart offers free pet photos with the Easter Bunny"